A big part of the work in creating a project is making sure that your user interface and your model are connected: user inputs are written to model variables, model variables are displayed and updated in the interface, and operations (functions or methods) in the model are called from the interface at appropriate times. This simplest way to do this is to use the Interface Builder to build the user interface for your project. Epicenter also provides several different APIs, at different levels of abstraction, so you can choose which interfaces make the most sense for you and your project. 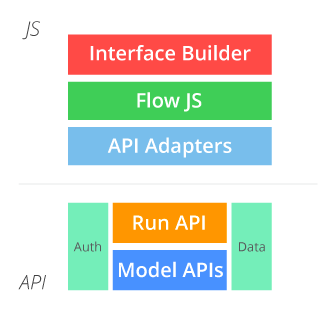 This example compares sample code written at different levels of the Epicenter stack (Flow.js, Epicenter.js API Adapters, RESTful APIs) to help you make this choice. For our example, let's start with a very simple model. This one is in Python, but you could write something similar in any of our supported modeling languages. Our model has three variables, only one of which is persisted, and one operation. Read more about the Run API. For this example, we want an interface that allows end users to enter revenue and cost, call the operation to calculate profit, and view the calculated profit. Note that our Team ID is "acme-simulations" and our Project ID is "demo". Flow.js provides bindings between HTML elements in your user interface and variables and methods in your project's model. The Interface Builder generates code using Flow.js. If you initially use the Interface Builder to create your interface, you can easily edit or add to this generated code once you have a little familiarity with Flow.js.